Over 300 projects in 11 years. We understand Vietnam!In-depth knowledge of the market and strong networks in Vietnam. You need sourcing opportunities, suppliers or distribution partners in Vietnam? You plan a strategic investment or need to improve your business performance? 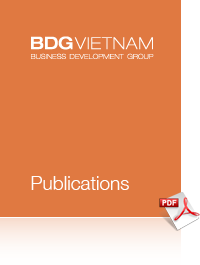 BDG Vietnam’s consultants help you to realize your plans. The Spotlight Vietnam Newsletter aims to present major socioeconomic developments, investment opportunities and events happening in Vietnam. We invite you to subscribe and embark on a unique journey with this exciting ASEAN country! Vietnam’s healthcare system, market and import regulations for medical devices. Advice to foreign suppliers how to enter the market. With Vietnam's strong GDP growth of the past decade, and hence increasing prosperity, opportunities for sales are rising.